This is a Arduino-compatible autopilot board designed by Chris Anderson and Jordi Muñoz of DIY Drones using the new ATMega328. This board was used to win the annual autonomous vehicle competition put on by SparkFun. Other necessary elements, including aircraft recommendations, can be found at the project's home page. Controller designed to be used with autonomous aircraft, car or boat. Infrared sensor required only for aircraft. Comes with a 6-pin GPS connector for the 1Hz EM406 GPS module. Four RC-in channels (plus the autopilot on/off channel) can be processed by the autopilot. 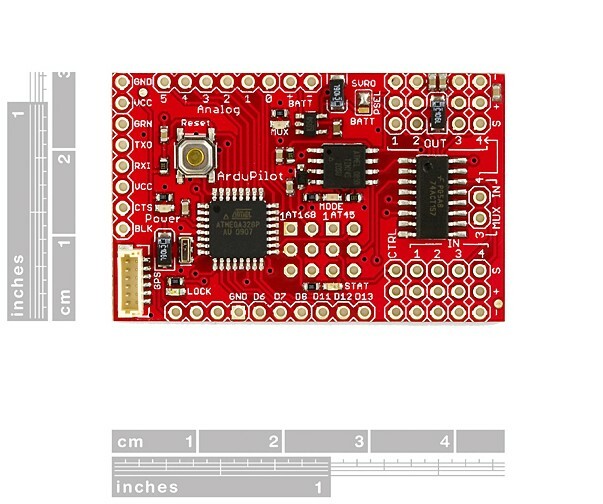 Get ArduPilot Main board from DFRobot Store or DFRobot Distributor.